According to Jost and others, those Karaites who, after the capture of Jerusalem by the Crusaders, left the Holy City, and settling in Constantinople adopted this name in memory of their beloved former home. This is denied by Frankl (in "Monatsschrift," 1882, p. 74), who refers to Benjamin of Tudela's description (ed. Asher, p. 70) of the Abele Zion and Abele Yerushalayim ("Mourners for Zion and Jerusalem") in southern Arabia, who dress in black, live in caves, keep fasts during the week-days, and abstain from meat and wine, continually praying for the return of Israel, and bearing the name of Rechabites. 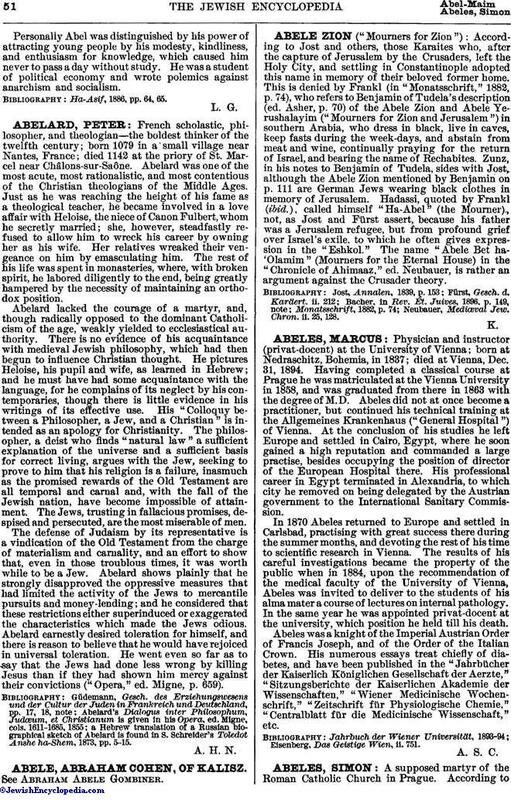 Zunz, in his notes to Benjamin of Tudela, sides with Jost, although the Abele Zion mentioned by Benjamin on p. 111 are German Jews wearing black clothes in memory of Jerusalem. Hadassi, quoted by Frankl (ibid. ), called himself "Ha-Abel" (the Mourner), not, as Jost and Fürst assert, because his father was a Jerusalem refugee, but from profound grief over Israel's exile, to which he often gives expression in the "Eshkol." The name "Abele Bet ha-'Olamim" (Mourners for the Eternal House) in the "Chronicle of Ahimaaz," ed. Neubauer, is rather an argument against the Crusader theory. Neubauer, Mediœval Jew. Chron. ii. 25, 128.